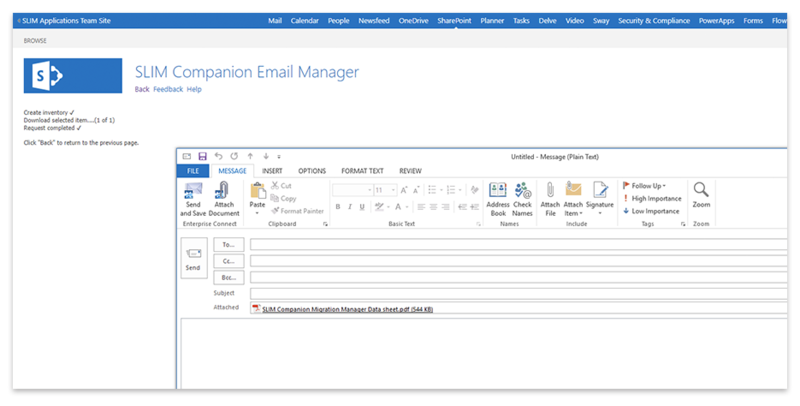 SLIM Companion™ Email Manager increases user productivity and provides unique functionality to simplify your work. The products from SLIM Applications saved my company weeks of time. I recommend their tools to all other SharePoint users. Sort emails by received date, group by conversation or search for the sender. Preview emails in your browser and directly open email attachments. Select one or more documents in SharePoint and directly attach them to an email. 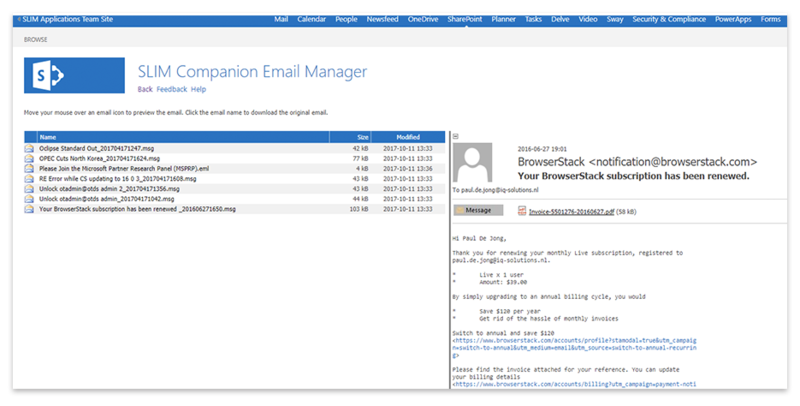 SLIM Companion Email Manager bridges the gap between your mail client and SharePoint. Fast and reliable uploading of emails, extraction of email metadata, unique previewing capabilities and innovative capabilities to attach SharePoint documents to emails makes this an indispensable tool for the SharePoint community. Before presenting the features of SLIM Companion Email Manager it is important to understand the capabilities of out-of-the-box SharePoint. In short, standard SharePoint provides a poor email management solution. Emails are stored as regular documents in document libraries without email metadata. As a result users cannot sort emails by received date or group emails by conversation. The file names in most cases will be based on the email subject. Email replies are named with a sequence number e.g. subject (1).msg resulting in meaningless file names. This simple naming mechanism also introduces a risk that emails are overwritten by other users even though they contain different content. SharePoint Online (Office 365) provides email previewing capabilities by using Office Web apps to generate a PDF version of the email. The PDF rendition sometimes does not show all the textual and/or graphical content. Email attachment names are shown but they cannot be opened. Users need to download the email to their computer and then open the email using a mail client before they can access the attachment. This is not always possible. For example, opening an msg email on an macOS (OS X) client, an iPad or a computer without Outlook. Users also frequently need to attach a SharePoint document to an email. This involves downloading of the document, opening a new email in their mail client and then attaching the downloaded document. This becomes even more cumbersome when dealing with multiple documents or even a complete folder structure. Basically standard SharePoint lacks functionality to properly manage emails. Email Manager is a SharePoint add-in that needs to be installed once on your SharePoint environment. It is available via the Microsoft Office Store and meets the strict requirements imposed by Microsoft for SharePoint applications. There is no need to install any software on the user’s computer since it is fully browser-based. Your data is save because the emails are processed in your browser. The tool is easy to use because it extends the standard SharePoint interface. 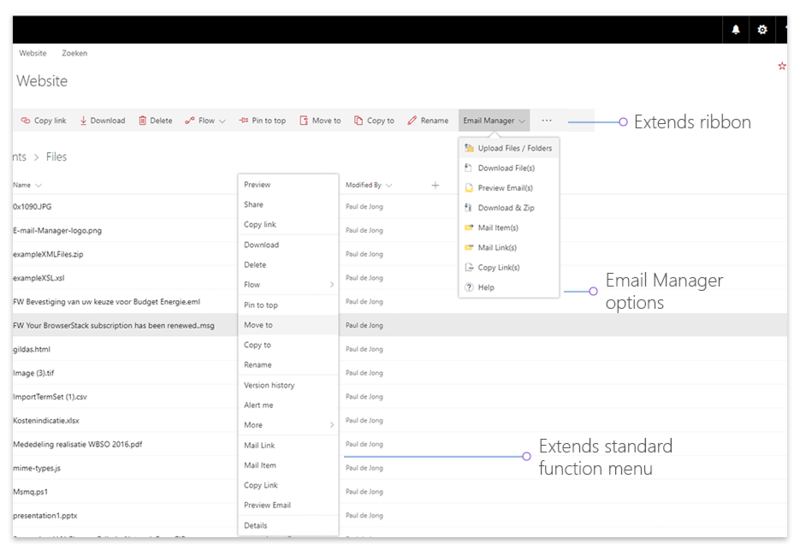 Specifically it shows a separate Email Manager section in the ribbon of document libraries and adds options to the ellipsis menu (…) of items. 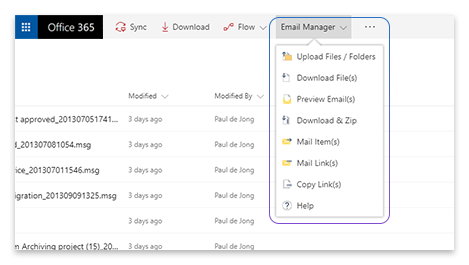 Select the option “Upload Files / Folders” from the ribbon to open the Email Manager page. 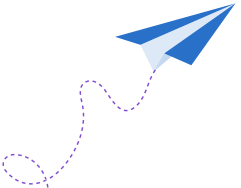 Upload emails into Email Manager by using drag and drop. Depending on your email client this can be done directly (e.g. ThunderBird) or requires an intermediate step via the desktop (e.g. Outlook). You can upload multiple emails in a single operation. Email metadata such as To, From, Subject, … is automatically extracted and captured into the corresponding SharePoint columns. Users can also set custom metadata (e.g. 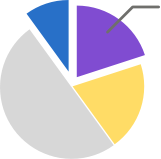 customer name or security classification). The latter is key for organisations that use custom metadata or use SharePoint for records management. Email Manager uses parallel processes for uploading resulting in superior performance. Typical email upload times are 1 s per email. Locating and finding emails in standard SharePoint is hard. The file name offers limited information and using search (full text) may return a large set of results. Email metadata such as From, Received date and Conversation enables users to organise, filter and locate emails in a simple way. The received date can be used to sort emails similar to Outlook’s Inbox. In a similar way emails can be grouped by conversation to show an email thread. Searching for emails is also much more efficient. For example it is possible to search by sender (similar to using from:sender in Outlook) or search for a specific subject. Email Manager provides fast and clear previews of emails in the browser. Email attachments are shown as links and the email attachments can be directly opened. Attaching a SharePoint document to an email can be done in a single click. Open the document’s ellipis menu and select “Mail Item”. This generates a new email with the selected document attached. If you need to attach multiple documents simply select the checkboxes for each of the required documents and click “Mail Item(s)” in the “Email Manager” section in the ribbon. Attaching a folder structure as a zip file to an email is also possible. 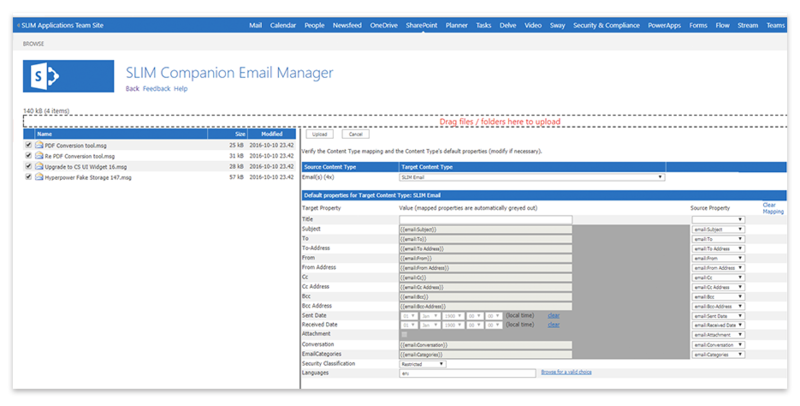 The current version of Email Manager works with msg and eml emails. The tool supports the latest versions of Chrome, FireFox and Opera plus Internet Explorer 11 and Edge. Note: macOS (OS X) users are recommended to use Chrome or FireFox because of Safari’s limited HTML5 support. 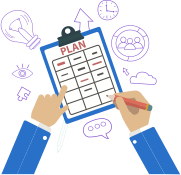 The tool is compatible with SharePoint Online (Office 365), SharePoint 2013 and SharePoint 2016. The add-in works with both the modern and classic views in SharePoint. The applications of SLIM saved me almost a month of time. I would advise them to all SharePoint professionals.